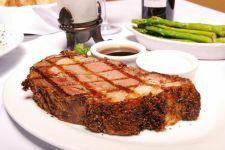 Prime Steakhouse and Wine Bar is an upscale steakhouse specializing in Prime Rib. We also have an array of other steaks, seafood, chops and more… Prime is like a San Francisco supper club with live music in the dining room Thurs-Sun. We have an extensive wine list and full bar. Join us for Prime Cocktail hour seven days a week with special themes and great cocktails 5-7pm.